Thursday's case, read by 60,000 people, provoked a bit of anguish among readers because they weren't all sure they would recognize this finding of LAD occlusion. Others thought it was obvious. Others thought they would detect it with troponins or serial EKGs (serial EKG was done and did not change; I don't know about serial trops, but one was "negative.") Some persistently denied that the T-wave in V2 was a specific sign of ischemia. 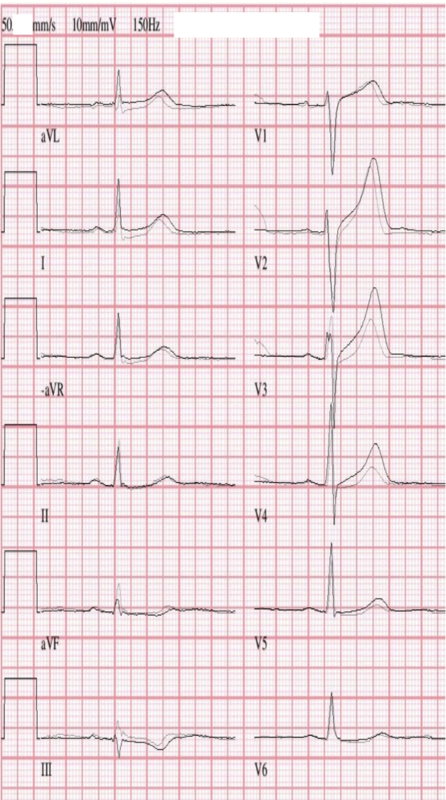 These are 10 cases of LAD occlusion with subtle Hyperacute T-waves in lead V2 (or V3) only. Formula to differentiate Normal Variant ST Elevation (Early Repolarization) from Anterior STEMI. 2. Use contrast echocardiography (This is the most reliable, short of angiography). Bedside echo without contrast or speckle tracking can be misleading. You must be an expert at this to rule out a wall motion abnormality. 3. A positive troponin is useful. A negative one does not rule out MI. 2 or 3 do not rule out unstable angina, even in the era of high sensitivity troponin: this study by Thelin et al. showed 100% sensitivity for MI, but only 95% sensitivity for ACS using hs-TnT. 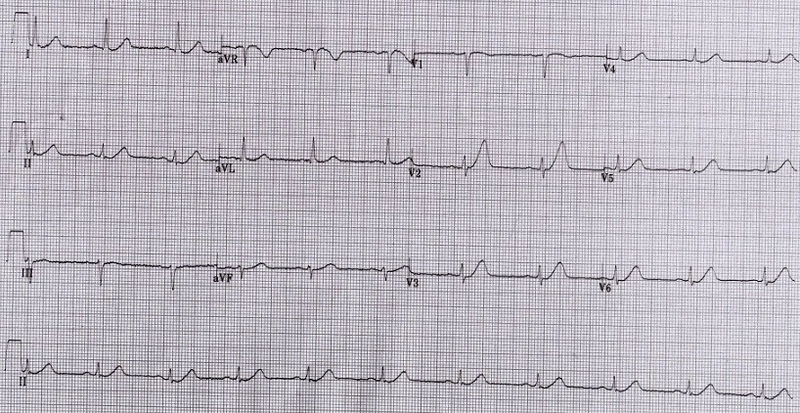 Case 7 (this one links to many other cases of hyperacute T-waves. This one is not posted, but was an LAD occlusion that went unrecognized. The patient lived but lost the entire anterior wall. Only the ECG Diagnoses Acute Coronary Occlusion. Do not be Fooled by a Negative High Sensitivity Troponin. A 20-something presented with one hour of chest pain. You can see the larger size of the T-waves on the second ECG. The high sensitivity troponin T was 5 ng/L (barely measurable: LoD = 5 ng/mL, 99% = 14 ng/mL. The next ECG was 2.5 hours later and showed a huge anterolateral STEMI. 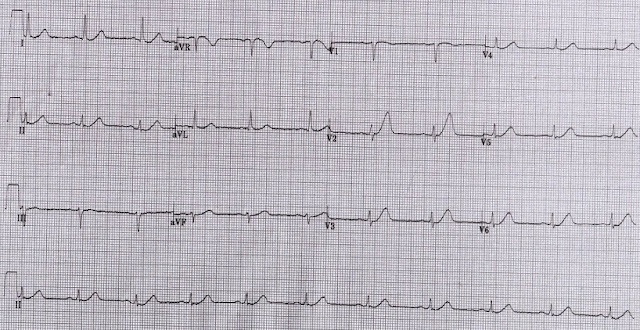 THANKS so much to Dr. Stephen Smith for assembling these 10 cases from prior Blog posts of his to definitively illustrate the phenomenon of anterior hyperacute T waves. My SUGGESTION — For anyone involved in acute care who is not yet familiar with (and regularly following) Dr. Smith’s ECG Blog — SHOW THEM these 10 ECGs and tell them ONLY that these are ECGs from 10 patients who presented to the ED with atypical chest discomfort (I suggest using “atypical” chest discomfort as the ED presentation — so as not to make things too obvious). 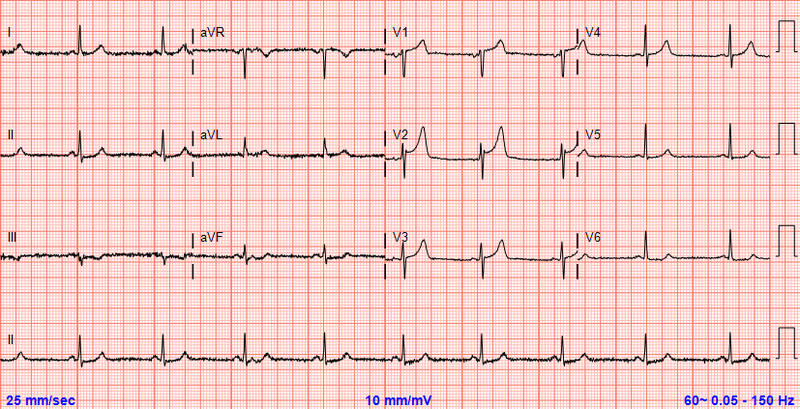 Then ASK THEM to indicate which (if any) of these tracings should be suspicious for possible acute anterior STEMI? Do NOT tell them that they ALL are … Ask them to brief say WHY or WHY NOT each tracing is (or should not be) suspicious for acute anterior stemi. Dr. Smith has given links to the detailed answers in his prior Blog posts. I’ll offer the following “quick” answers to the above questions. Anyone not scoring 100% should ideally review each of the links provided under the figures. 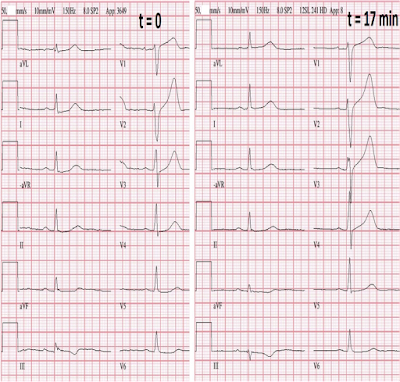 ECG-1 — Disproportionately tall anterior T waves (ie, hyperacute-looking anterior T waves in V2,3,4). The leads of most concern to me are V3,V4 — in which the T wave is fatter-than-it-should be with a wider-than-it-should-be base. Leads III and aVF confirm the abnormality by the presence of reciprocal ST-T depression. ECG-2 — Disproportionately tall anterior T waves. Leads V2,V3 are of most concern (the T clearly much taller-than-it-should-be in those leads) — with inf. reciprocal changes and an overly tall T in tiny aVL (compared to the tiny size of the QRS in this lead) confirming the abnormality. ECG-3 — the case that prompted this post (See link under the figure for details). 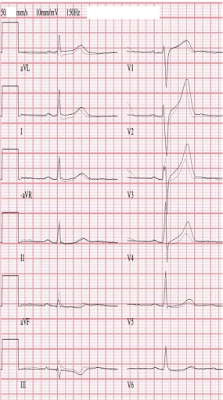 ECG-5 — Clearly wider (and fatter at the peak) T waves in V2,3,4 — with definitely abnormal initial ST segment straightening (that confirms the abnormality) in lead V2. Similar fat/wide T in aVL — with clear reciprocal ST-T changes in III,aVF (note tell-tale biphasic T waves in these two inferior leads). 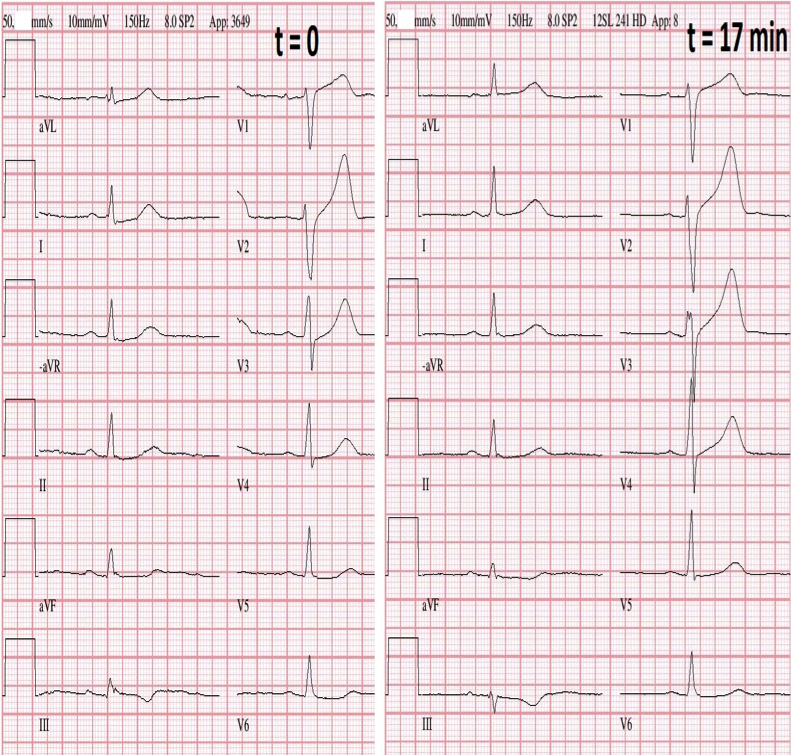 ECG-7 — Disproportionately tall T waves in V2,3,4. Note initial q waves that shouldn’t be there in V2,V3 — with subtle-but-real inf. reciprocal change (and subtle q + ST elevation in aVL) to confirm the abnormality. THANKS again to Dr. Smith. Detailed discussions can be found in the links below each figure. I second the motion on reducing the pretest probability of reading a blog on tricky ecg’s. Throw in some look alikes, make it 1 in 10 is a confirmed coronary occlusion. Thats some difficult cases! Noticed that in all but one case (nr 8) there is more or less of inferior st depression (nr 10 also very subtle, if any). Nr 8 has lateral depression. Also, the r wave progression is often affected. Thanks for postinf these cases! This synopsis is very helpful. Thanks for compiling. Great examples Dr Smith, thank you for sharing your wisdom. Interestingly, in half of those 10 tracings there is tall TW in lead V1 whether it means anything or not is up for a debate. The changes on ECG often are so subtle, that one would have to have their paranoid ACS radar constantly on, and then one will have dickens of a time arguing and trying to prove the point with cardiology that these patients need to be taken seriously. The other night, at 4am I was trying to convince cardiology resident that an old woman was having cardiac event with STE in posterior leads of 0.5mm and almost arguable STE in V6. Once hsTnI came back at 20,000 no more words were needed. Great cases, a lot to learn. People tends to believe that a "smiling" ST elevation in right precordial lead is due to Benign Early Repolarisation or Pericarditis ECG changes, I have seen few patients with acute total occlusion of LAD with so call "benign smiling" ST elevation ECG.